Way back in 2011, Jessica wrote about Fletcher’s then-brand new Map Your Future application pathway. Being an optimistic bunch, we were excited to bring online a unique program to help younger candidates get to Fletcher (in brief, “MYF” is a mechanism for a two-to-three year deferred admission for college seniors and recent grads. Check out the details to learn more). Like any complex new initiative, it’s been a gradual process involving a lot of tweaks and behind-the-scenes administrative work (a special shout out here to my Admissions colleague Liz, who has largely taken the lead in shepherding MYF along). We’ve had some wonderful students come to Fletcher via MYF, among them recent graduate Cindy, a familiar voice to regular readers. It’s been a slow build; the first couple cohorts of MYF students to arrive at Fletcher were in the range of two to four students. 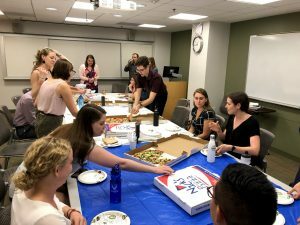 In the early going, a single pizza was plenty for the group at the welcome-pizza-lunch-with-admissions we hold for these students each September. Cut to 2018, and our little program that could is no longer so little! 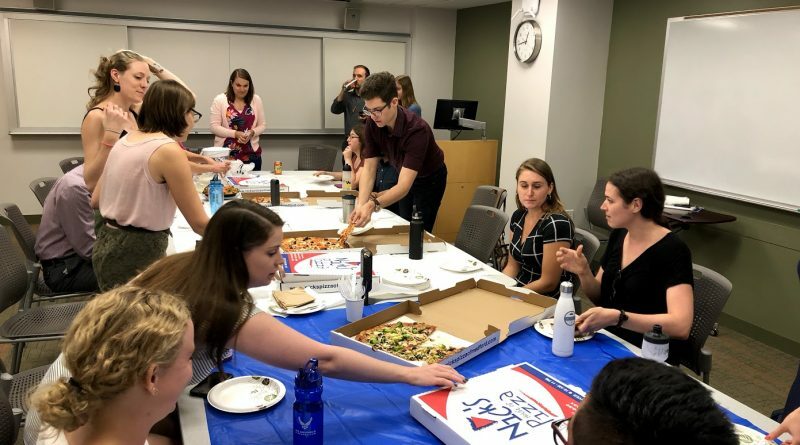 Our once small meet-and-greet with a few slices and a handful of students in the Admissions office now requires a full classroom and a fat stack of pies, and can easily sustain four or five simultaneous conversations. The arrival of new students to Fletcher is always exciting for us, but the growth of MYF feels particularly special. We’ve worked with some of these candidates for as long as four years, and it’s a real thrill to have them arrive at Fletcher on the heels of the work they’ve been pursuing over the past few years (among the many organizations I heard during intros are the State Department, the National Endowment for Democracy, the Noor Majan Arabic Institute in Oman, and the Clinton Health Access Initiative). MYF students have consistently thrived here, and have often told us that their prior professional experience was crucial in helping them maximize their time at Fletcher. So for all you current undergrads, keep MYF in mind as an option for getting yourself to Fletcher. The free pizza is undoubtedly the smallest of many benefits you’ll enjoy.